Could the earth contain a subcrustal ice layer? Jupiter's largest satellites, Ganymede, (diameter 5,262 km, density 1.94 gm/cm3), and Callisto, (diameter 4,800 km, density 1.86 gm/cm3) have water/ice mantles and rocky cores. Ganymede's crust probably consists of a thick layer of water ice. The earth is unique in the solar system because of the presence of liquid water at the surface, and its high density core. The earth's atmosphere, also, is uniquely constituted for sustaining life. But evidence for ice and water elsewhere naturally leads to the question, why couldn't the earth's interior also contain an ice layer? The Subcrustal Ice Earth Model (SIEM) is being developed to investigate this possibility. According to the conventional theory of plate tectonics, water and other materials from the earth's surface are recycled to the deep interior by hypothetical processes of subduction and convection. The driving force for the postuated movements of the plates is mantle convection, a process invoked by Arthur Holmes as a mechanism for continental drift. The Inner Workings of the Earth by Michael Wysession, from American Scientist, March-April 1995 presents a discussion of current thinking about mechanisms for recycling water and other materials from the earth's surface to the deep interior. According to the theory, some of this water returned to the interior by convection driven processes becomes ejected in volcanic eruptions. The convection hypothesis comes under critical scrutiny in: Is mantle convection no more than a storm in Arthur Holmes' porridge bowl? This author of this article [presumably Dr. Ken Duckworth, professor of geophysics at the University of Calgary], uses the pseudonym A.H.E.Retic. He tilts against "a concept so powerful that even today it has become a Mantra to be chanted by all should they ever hope to get a grant to study any aspect of the crustal behaviour of the earth". The article identifies several fatal flaws in the standard dogma of mantle convection, and develops some helpful Retic's Rules. Could the concept of recyling of water from the earth's hydrosphere back into the depths of earth, (needed for the conventional view of an ancient earth, billions of years old) be wrong? Thermodynamics suggests bodies that are heating up degass. The high concentration of radioactive isotopes in rocks could mean the earth is heating up. See The Heat of the Earth. A 1995 paper by Lars Stixrude, Mineral physics of the mantle from Reviews of Geophysics considers possible mechanisms by which water and volatiles could exist deep in the earth's interior, combined with other minerals. Stixrude notes that 1% by weight water stored in the earth's mantle amounts to 30 hydrospheres. If the water and volatiles in the earth's interior are primeval, the earth could not be billions of years old! The New Alchemy by Robert M. Hazen reviews the history of high pressure research. Deep Waters is a recent article from New Scientist about why abundant water exists in the earth's mantle. Earth Density inter-active model - Try to figure out the density distribution in the earth, with the correct total mass and moment of inertia. AK135 Travel Time Tables: A seismic model of the earth's interior. This chart of seismic velocities shows clear discontinuities exist in the earth's upper mantle near about the 400 km and the 660 km levels. Deep-focus earthquakes are clusted near the discontinuity at 660 km. Some scientists consider these deep earthquakes to be anomalous; conventional earth models assume very high temperatures exsit at those depths, where earthquakes would be less likely to occur; see What is exploding 400 miles beneath our feet? Information about gravity and magnetic anomalies and their implications for the earth's interior is discussed at: Complexities of the inner earth. The diagram at right is a phase diagram for water to 200 kbar and 450 degrees C. This is figure 1, p. 2455 from Mishima, O and S. Endo, 1980. Phase relations of ice under pressure. J. Chemical Physics 73(5) 2454-2456. H2O Phase Diagram for low pressures. The graph at left shows the variation of the elastic moduli of Ice VII with pressure, calculated from experimental data in: Polian, A. and M. Grimsditch. Brillouin scattering from H2O: Liquid, ice VI, and ice VII. Physical Review B 27(10): 6409-6412, May 1983. The upper line shows the Bulk Modulus; the lower line is the Shear Modulus. The graph at right shows the variation of seismic velocities with pressure in Ice VII, calculated using the data in the previous reference together with more recent published density measurements. A discussion on the thermodynamics of freezing water. High flow rates of emissions from hydrothermal vents on the ocean floor provide possible evidence for melting of a subcrustal ice layer in the upper mantle. Conventional explanations invoke convection of seawater in the vicinity of the vents as the driving mechanism. Flow rates as high as 5 m/sec have been observed at some black smokers. Pressure in the conduit through the ocean crust must decrease in the direction of flow, and frictional resistance is greater for high flow rates. The convection mechanism, based on the density difference between the heated water and cold sea water, could work only if some unique system of cracks allowed sufficiently large volumes of sea water to flow down to the heat source with a minimum of frictional resistance. In the convection hypothesis, enormous amounts of heat must also be continuously supplied for the duration of the vents to heat the circulating sea water. For an introduction to submarine hydrothermal vents, see Deep Sea Hydrothermal Vents by Melanie Summit and the University of Washington School of Oceanography Exploraquarium. A discussion of the convection mechanism can be found in Hydrothermal processes at mid-ocean ridges by Susan E. Humphris. The episodic nature of venting processes does not support the convection hypothesis, as the venting of large volumes of pressurized water in a short time from reservoirs in the oceanic crust seems inconsistent with convection. The discovery of "megaplumes" of enormous volumes (up to 130 km3) of hydrothermal fluid over the Juan de Fuca Ridge in the northwest Pacific Ocean in 1986 and 1987 is discussed in Episodic venting of hydrothermal fluids From the Juan de Fuca Ridge by Edward T. Baker et al. The rocks of the ocean crust and the earth's interior and hydrothermal emissions are enriched in the primordial helium isotope, 3He. The higher 3He/4He ratio of vent emissions distinguishes them from sea water. The plume of 3He enriched seawater caused by hydrothermal venting or volcanic activity at the East Pacific Rise was investigated by the Helium and Tritium in the World Ocean Circulation Experiment (WOCE) Pacific Program. Waters Under the Earth - What ancient scriptures say about the subterranean waters. Two Really Deep Oceans from Science Frontiers, by William R. Corliss. The Biosphere Below by Daniel Grossman and Seth Shulman discusses the living microorganisms that thrive kilometers deep in rocks, some called heterotrophs, which feed on decaying plant or other organic material buried in sediments; others called lithotrophs, perhaps the most common, which live off geothermal energy, eating hydrogen present in deep rock formations. Deposits of methane hydrate occur in sediments of the ocean floor, and in Arctic permafrost areas, including Siberia. Conventional theory, which assumes the earth was once a hot, molten body, says most of the methane in submarine sediments came from bacteria, but this is still uncertain. It is interesting to note that properties of clathrate hydrates are studied as possible constituents of the interiors of other bodies in the solar system. The following links provide information about submarine methane hydrates. Gas Hydrate at the U.S. Geological Survey - Answers to basic questions about gas hydrates. Methane Gas Hydrate -by the Marine Geology Department, Geological Survey of Japan, has information and links. Also, you can see a movie of pieces of burning methane hydrate. Harvesting Natural Gas from the Ocean Floor - Interesting article by David Graham. Gas (Methane) Hydrates -- A New Frontier - by Dr. William Dillon, U.S. Geological Survey. The Mother Lode of Natural Gas - an article on methane hydrates in Science News by Rich Monastersky. 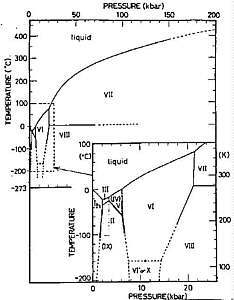 Phase diagram of gas hydrates - a figure from Gas hydrates - for geophysicists. Potential Feedback Between Climate and Methane Clathrate - Danny Harvey examines possible connections between submarine methane hydrate emissions to the atmosphere, and climate. METHANE HYDRATES: A Study of Their Impact on Geoacoustical, Geochemical, and Hydrological Properties of the Continental Margin Environment - by Joseph F. Gettrust et al. © Copyright 1996 by Douglas E. Cox Return to The Creation Concept All Rights Reserved.